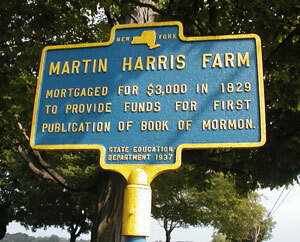 Martin Harris was an early supporter of the Prophet Joseph Smith and lived on a 300-acre farm outside of Palmyra. Martin received a portion of the farm from his father’s original 600-acreage. Martin was considerably older than Joseph and first learned of the boy Prophet in 1827 when he hired Joseph, Sr. and Hyrum.1 Martin aided Joseph by giving him 50 dollars to help defray the costs of going to Harmony and acted as scribe as Joseph began the translation of the plates that contained the Book of Mormon. 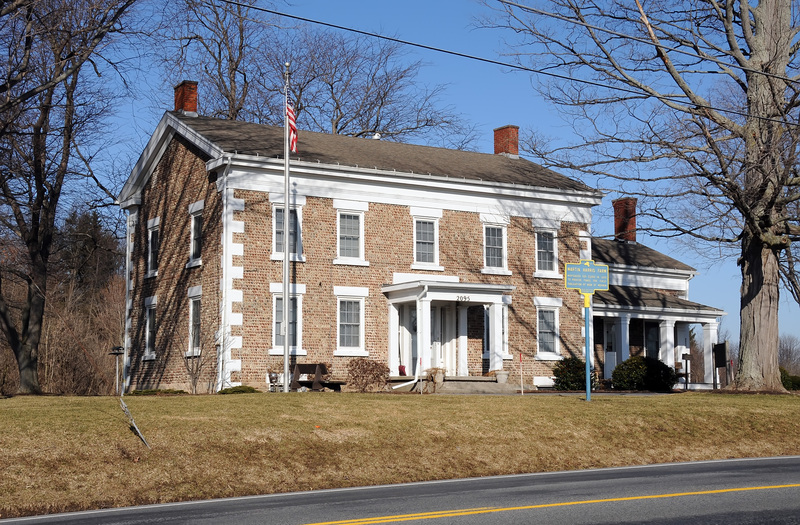 This home was built on the site where the Martin Harris home, Palmyra, NY was once situated. Photo by Kenneth Mays. Martin’s wife Lucy became offended that she was not allowed to see the plates which Martin was helping Joseph translate. After pleading with the Prophet to allow him to show his family the manuscript, it was here that Martin Harris brought the 116 page manuscript which was stolen from him. As a result, he was no longer allowed to act as scribe in translating the Book of Mormon. Notwithstanding, Martin Harris was still allowed to be one of the Three Witnesses of the Book of Mormon and was shown the plates through a divine manifestation. 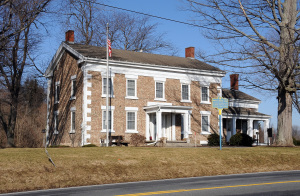 The home that currently resides on the farm is not the original home and is privately owned. 1 Susan Easton Black, Who’s Who in the Doctrine and Covenants (Salt Lake City: Bookcraft, 1997), 124. 2 Milton V. Backman, Jr., and Richard O. Cowan, Joseph Smith and the Doctrine and Covenants (Salt Lake City: Deseret Book Co., 1992), 24 – 25. 4 Andrew Jenson, Latter-day Saint Biographical Encyclopedia: A Compilation of Biographical Sketches of Prominent Men and Women in the Church of Jesus Christ of Latter-day Saints, 4 vols. (Salt Lake City), 96. 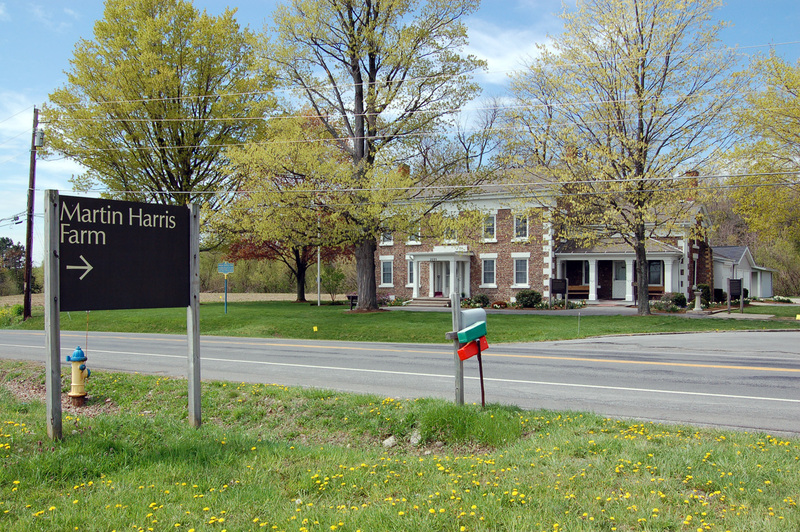 Hours of Operation: The Martin Harris Farm is privately owned and not open for tours. However, a marker exists there describing the significance of the location. 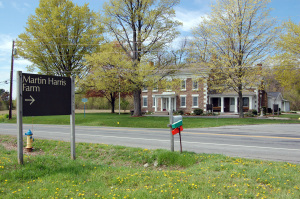 This home was built on the site that was once the Martin Harris home, Palmyra, NY. Source(s): Lucy Mack Smith, History of Joseph Smith by His Mother (Salt Lake City: Stevens & Wallis, Inc., 1945), 123-131. Richard Lloyd Anderson, “Martin Harris: The Honorable New York Farmer,” Improvement Era, 1969. Rhett Stephens James, “Harris, Martin,” Encyclopedia of Mormonism, ed. Daniel H. Ludlow et al., 1992.